Winston DaCosta Jordan is a practicing Economist who has been serving Guyana for nearly 40 years. He is the former Director of the Budget Office, Ministry of Finance, having begun his career at the State Planning Secretariat in 1981. His significant previous positions include Country Analyst, Economist Intelligence Unit (EIU) 2009 – 2015 and Technical Coordinator, Public Management Modernization Programme (IDB) 2006 – 2008. From 1985 to 2008, he worked extensively at the Ministry of Finance in various portfolios as Budget/Economic Adviser; Budget Specialist; Adviser in Budgeting; Budgeting and Public Investment Specialist and Director of Budget. Minister Jordan graduated from the University of Guyana with a Bachelor of Science Degree (Distinction) and successfully pursued a Master’s Degree in Economics from University of Warwick. He holds also a Certificate in Budgeting & Structural Adjustment Management from Penn State University and a Certificate in Public Sector Budgeting from Harvard University. He has taught at the University of Guyana as well as served as a Director on the Boards of GAIBANK, the Bauxite Industry Development Company Limited (BIDCO) and Guyana Cooperative Financial Service (GCFS). Additionally, he served as Alternate Director at Caribbean Development Bank as well as Temporary Governor and Alternate Governor at Meetings of the IDB, CDB and IMF/World Bank Group. His distinguished educational accomplishments are recognized nationally, regionally and internationally. He has received a number of honours and awards including the Vice Chancellor’s Special Award – University of Guyana; Commonwealth Scholarship; UNDP Fellowship; Hubert H Humphrey Fellowship; and Harvard Ministerial Leadership Program. Minister Jordan is married to Charmaine Atkinson-Jordan. He has three children: Jo-Anne Milner, Darren and Yanic Jordan. 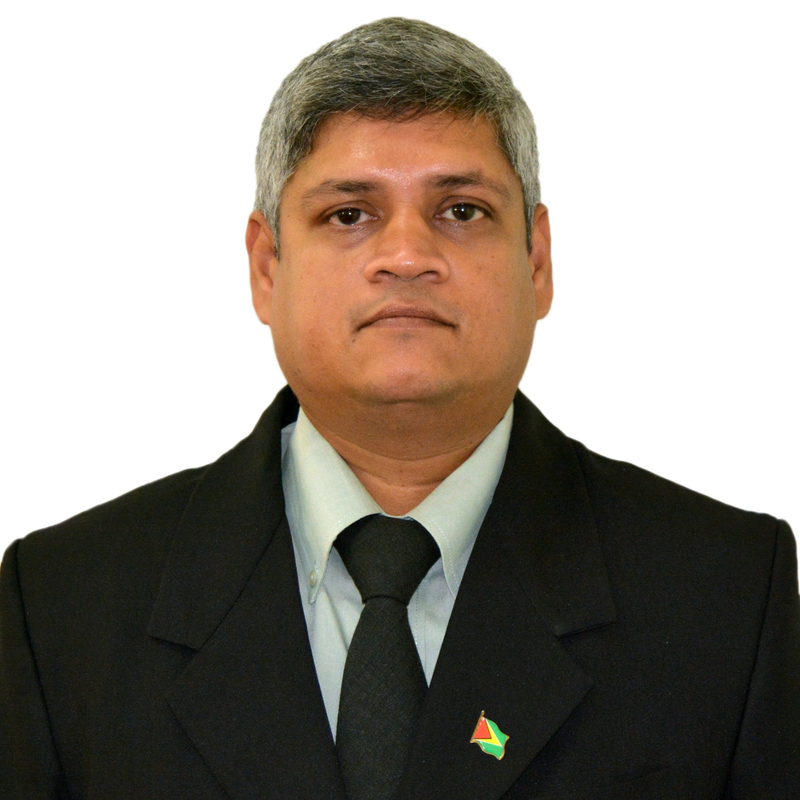 Jaipaul Sharma became Minister within the Ministry of Finance when the APNU+AFC Coalition won Guyana’s National and Regional Elections on May 11, 2015. He has long been a Government Accountant with an excellent knowledge of accounting concepts and strategies that yield best financial outcomes. He also has extensive experience in Auditing which includes reviews, compilations as well as government organization audits. Minister Sharma worked at the Office of the Auditor General from 1993 to 2001 where he did valuable work in testing the design and effectiveness of internal controls of Government transaction processes, verified compliance of Government entities with established policies and procedures relevant to Current, Capital and Project Expenditures. From 2001 to 2005, he entered the Public Service Ministry as Chief Accountant with responsibility for managing the accounting operations of the Central Accounting Unit of the Ministry. He also prepared Annual Budgets Proposals on behalf of the Ministry for submission and review by the Ministry of Finance and conducted expense forecasts. His exemplary work at PSM saw him moving to the Ministry of Labour, Human Services and Social Security as in 2005. He had a brief stint as Principal Assistant Finance Secretary for the Regional Democratic Council of Region 6 after which he joined the Guyana Elections Commission as Chief Accountant from 2006 to 2010. During this time, his political career began to take shape and he became a Member of Parliament in January 2012 where he served as a Member of the Public Accounts Committee during the 10th Parliament. Mr. Sharma received his education at Christ Church Secondary School and other professional training institutions like the Institute of Government Accounts and Finance in India.